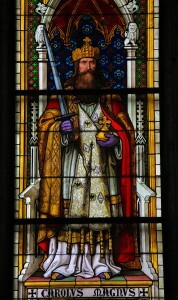 The exploits of Charlemagne are fairly well documented and widely known. 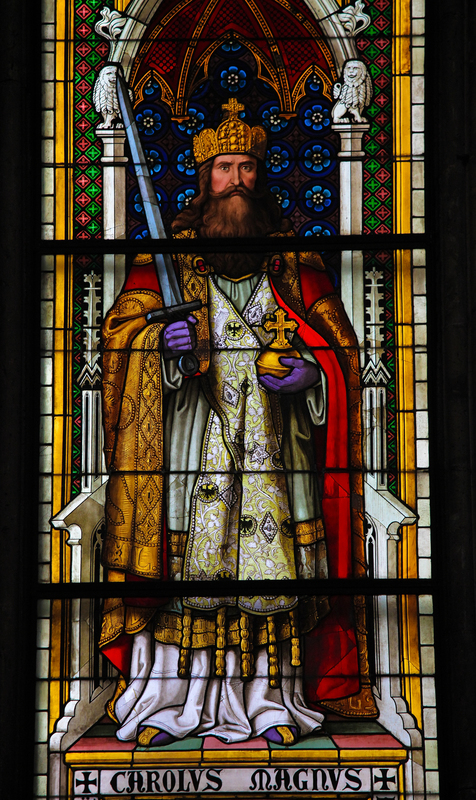 He was both the King of the Franks and the founding emperor of the Holy Roman Empire (technically, the Carolingian Empire). In this capacity, he is renowned for a wide variety of things usually associated with wisdom, such as diplomatic as well as military triumphs, a cultural renaissance, successful economic and administrative reforms and so on. There is a reason why he is called great. Importantly, he died in 814 A.D., well over a thousand years before anything that we would today recognize as Neuroscience. There are several recent papers on this very issue, for instance this one; lo and behold, it seems to be true. It looks like Charlemagne scooped these authors by about 1200 years. Or did he? I could easily spin a dense yarn about how this expression anticipated the results of literally decades worth of intensive research on perception, cognition and action. It would be a marvelous feast. I could discuss dorsal vs. ventral streams of processing, perception vs. action, perception for action vs. perception for cognition and a great many other “hot” topics of contemporary research in sensory and motor systems. The possibilities are almost endless and without reasonable bound. In fact, I could write a whole book about this. The title would be obvious. Recent history suggests that editors eat this kind of stuff right up and that it would also sell quite well. Because it would be wrong. Charlemagne was not a Neuroscientist. He was not even a scientist. Not even by a stretch. Not a chance. Not even close. Asserting this would grossly misrepresent the character of science and what scientists do. Pretty much everyone has intuitions about the workings of the world, including the workings of the mind. Sometimes, these intuitions even turn out to be largely on target. But that is not what science is about. For the most part, science is about turning these hunches into testable hypotheses, trying to then test these hypotheses to the best of our abilities (this part is extremely hard) and then trying to systematize these systematic observations into a coherent framework of knowledge that is aimed at uncovering the principles behind the phenomena under study. In other words, we are not trying to describe the shadows per se, but we are trying to triangulate and infer the forms from a multitude of multidimensional (usually) shadows, as hard as that might be in practice. It is not surprising that smart people are curious about a great many things and that their intuition is sometimes correct. In that sense, everyone is a physicist, neuroscientist, psychologist, chemist and so on. In other words, Spartacus was a neuroscientist. But that utterly trivializes science to a point that is entirely ridiculous. Modern science is nothing like that. It is precisely this moving beyond intuition that defines modern science. A very simple – and early – example is the dramatic difference between our naive intuitions about how objects fall and scientific descriptions how they actually fall. It works the other way around, too. Some sciences – psychology in particular – have a very big PR problem in the sense that most of their findings seem to be perfectly obvious (or in line with our intuitions) after the fact. This is an illusion, as people are actually not able to predict the results of social psychology experiments better than chance, if forced to do so from common sense and before knowing the outcome. It is important to distinguish this from bad science (or non-science), where the conclusions are not derived from empirical data, but follow from the premises a priori (analytic, not synthetic judgments). In any case, the fact that some scientific results are consistent with our intuitive a priori notions misses the point completely. That is not what science is about at all. It may be forgivable if a non-scientist does not understand these subtle yet fundamental things and makes embarrassing claims, but this person cannot then claim being a scientific expert at the same time. One can’t have it both ways. Really. So I don’t and I won’t. This entry was posted in Neuroscience, Pet peeve, Science, Social commentary. Bookmark the permalink. Hi Pascal, I’am Anamaria father, and we meat several years ago at the Conference in San Diego, where I was with Ana. She sent me your article about Charlemagne. Good idea. However, I was reading this in a context about the way the Internet changed our way of thinking. I was reading recently the interview with Nicholas Carr about his book and his opinion on digital social networks. As you may recall from San Diego,I was and I would continue to be interested in nonlinear aproaches. I wrote several books, which were not a success at all. But this did not discouraged me. The Internet was on my attention for sometime, and I wonder what the gains and loses would be with it. What N. Carr wrote in 2010 I said in one of my books in 2007, and I called it networking. I would try to turn my discourse on this side of the issue because it may give you some ideas about Charlemagne. It was known at the begining of the 20th Century an Indian mathematician named Ramunajan. He resolved all existing theoremes previously solved by other mathematician in his own way: he was not knowing about the solution brought by the others before him. His solutions were unique and different. After his early death, the world of mathematics still tries to understand his thinking. Many 20th Century mathematicians attributed to Ramunajan the capacity to see numbers and their relationship as proportions. On this path Ramunajan discovered several things including the congruency of numbers, which bears his name. The idea about Ramunajan was not new: it existed since Antiquity and was popular among the Alchemists of Feudal Era. All of them were looking for “magic numbers” and “golden ratios”. More recently (around 2000) several Japanese and Chinese mathematicians, analysing the “fractal” came to the conclusion that some proportions are repeated identical on many scales (self-similarity). In the summer/fall of 2010 a group of mathematicians made a great discovery about the “partition of numbers”: this partition (originally analyzed by Ramunajan) was a “fractal”. The conclusion did not occurred, yet, but the idea would be that “numbers and their relationship” define “proportions”. Even distances would be only “proportions”. However if ever this comes as a proof, this will change the dealing with nonlinear. The nonlinear would accept a very large number of solutions (choices or options) because we deal with very many causes, which generate a complex autcome. In nature these choices or options would occur during a “bifurcation process”. where the entity would decide which path of action would follow. Some scientists considered that nature would decide at the bifurcation to follow always the path of minimal energy expenses. In contemporary society we discovered this idea of multiple choices, and we try to choose. Is the choice always the path of minimal energy expenses? Most likely we choose because we have to. Some people would have special intuition, and their choice would be like the nature does, so they would be victors, and the rest would be the loosers. Some people will reinvent all theoremes anew, but with quite different demonstrations. These special skils always existed, and will always be. For the Internet players it will always be the benefit of interaction: during communicatng, people interact, exchanging info and energy. This would be the positive side. This flux of info tends to turn immense, and the interaction may lead to strange attractors and chaos; this would be the very negative part, which would imply a collapse (starting with personal level and going to the entire social network that is similar with the effects of a severe economical crisis). In my mind before occurring these extensive discussions about the Internet it was the idea that only a genetic mutation in our brain would be able to solve the nonlinear. According to N. Carr, before Guttenberg printing machine, people were less focused than when mass reading of books forced humans to focus on each issue. However this focus was a linear achievement. Currently at least we are at the crossroads of info fluxes, so our linear approach is sistematically disrrupted. This does not mean that we have turn into a nonlinear approach. Not at all. Possible this new constraint will produce an adaptation of the thinking system, and from nowhere, at some point into the future we will begin to deal with nonlinear and its solutions. Maybe that nowhere would be a brain’s mutation. The end this comment, I tried to give you an idea how the things possibly evolved until now and how they could switch into the future (I could not say near future). PS Excuse my convultions in exposing my view. It has been a lot to say and I have tried to reduce all to a minimum (a long minimum). Thank goodness I am not the only one thinking this! These “[name] was a [scientist]“ quotations are just mincing words, non-sequiturs, romanticising language, and pulling ‘meaning’ out of ill-contextualizes quotes. Yes, there is insight and great thinking but no science. Many, many current philosophers will be said to be “scientists” in the future and nearly most professional philosophers from the past are “scientists”. Romanticising, from the point of view of the interpreter, language at its best . Note: I know these things sell and the title speaks louder than the body’s words, like you state.